A text page from a 15c. 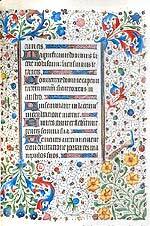 When you hear about medieval illuminated manuscript production do you imagine stoop-shouldered monks toiling in silence within a cloistered monastery? Until the second half of the 14th century that was the only way that Bibles and other religious texts were produced. It is only natural that books used in the religious community were made by artistically inclined brothers and sisters within the community; however, since they had taken vows of poverty, the books used by the monks and clerics were not owned by them as individuals. In fact all the art produced by monks was considered the property of the church and they couldn't even own so much as a doodle of their own making without violating the vows they had taken! That is, unless they were from wealthy and powerful families involved in the leadership of the church. Bishops, who were used to owning fine things before they took the cloth, requested private books of devotions be made for them that they could carry on their person. The noble laity, seeing the precious books filled with colorful pictures and gold, also desired to have similar treasures of their own. 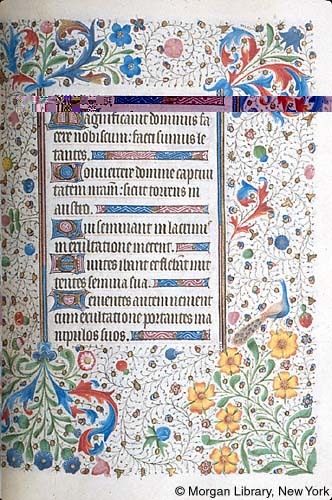 Royal patrons commissioned the monastery scriptoriums to make books for them and books of hours were requested more than any other kind of book. 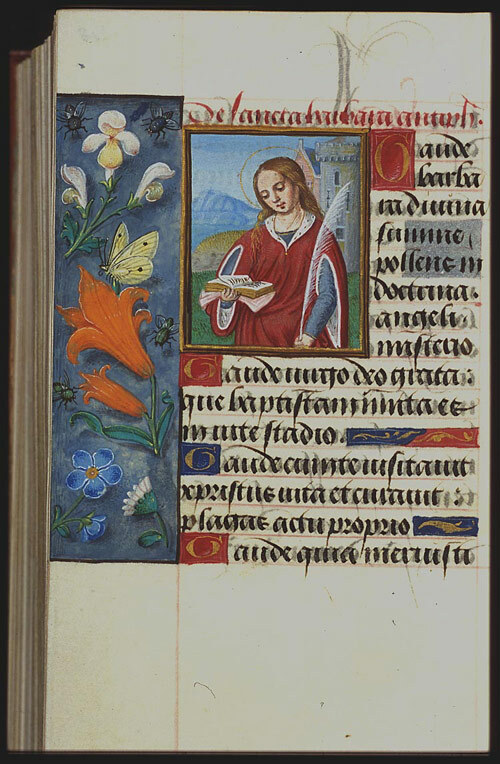 Click for an iIlluminated page from a 13th century book of hours made in a monastery.) The monesteries had so many orders that they even had to hire laymen to help them keep up with the work. Over time these laymen started their own workshops near the religious centers where they could deal directly with the wealthy patrons. Before oil painting became popular among the rich, the best ways of showing off one's wealth and power was to commission large scale frescos, tapestries, and statuary. These items were very impressive but not very portable. 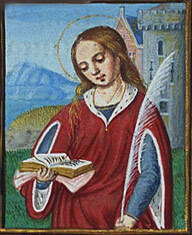 However, a small book of hours was prized for its ability to impress under all circumstances. It was like carrying around a whole gallery of art. However, whenever it was used, it not only symbolized the patron's wealth, but also spoke of the user's piety. Though men and women of wealth commissioned books on history, hunting, medicine, and other subjects, books of hours were the books they referred to most often. They contained prayers and devotions for different times of the day and each day of the year. 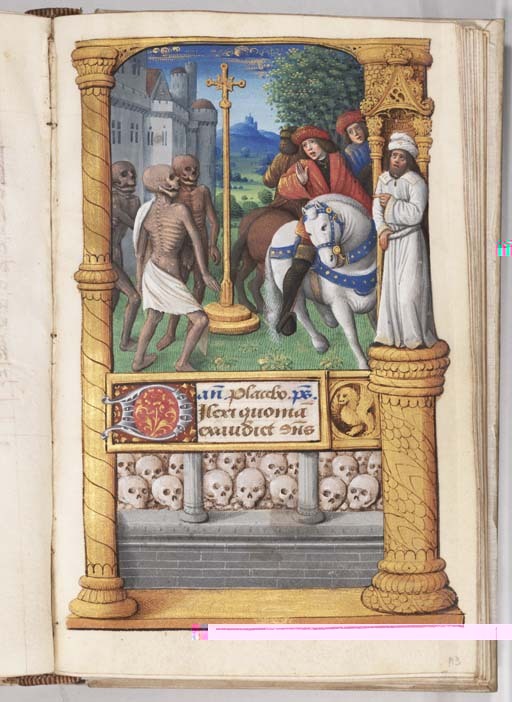 Books of hours also included a cycle of prayers for the dead, calendars of saints days and other holidays, and a whole section devoted to the Virgin Mary. The books were used during private prayers and public ceremonies like funerals, weddings, and baptisms. Books of hours were used to teach children their letters and empty pages at the end or beginning were used to record marriages and deaths in families. The Flemish (Burgundian Netherlands) towns of Bruges, Valenciennes, and Ghent became the biggest book production centers after 1440. Since different saints holidays were celebrated in different parts of Europe, the Flemish workshops had to adapt their text for different markets. For instance, if a book was "for Sarum use" it meant for export to England, and "for Rome use" meant for export to Italy. This Flemish style (sometimes called the Parisian School since many of the best Flemish artists relocated to Paris to be close to the wealthy French court) was defined by a lavish use of bright colors, naturalistic plants, numerous miniatures with realistic landscapes and portraits. The earliest of the celebrated Flemish artists were three talented brothers from Limbourg who worked for the Duc du Berry, regent of France. During their short lives they produced two of the most famous hand painted books of all time, the Très Riches Heures and the Belles Heures. Unfortunately these three brilliant artists died of the plague before they completed their work. 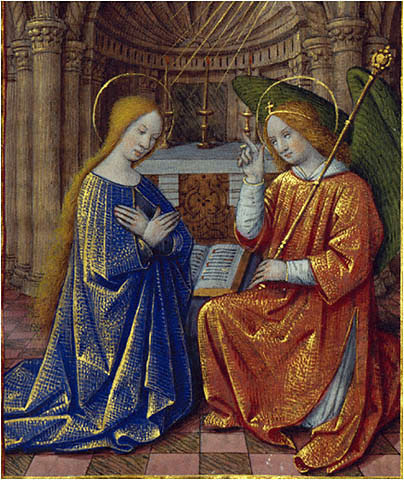 Other masters like Jean Fouquet and his famous pupils, Jean Poyet and Jean Bourdichon, became artists-in-residence to the French court after the Limbourg brothers and took the production of books of hours to new heights. But the Très Riches Heures remained unfinished until Duc Charles I de Savoie hired Jean Colombé to finish the book some 60 years after the deaths of the original artists. In Flanders, Simon Bening of Bruges, Lieven van Lathem of Antwerp, Simon Marmion from Valenciennes, and many others ran workshops that produced books exported all over Europe. The popularity of hand-made books was never higher. The 15th century truly was the golden age of the book of hours. The invention of the movable type printing press in 1439 lead to an explosion of trade in printed Books of Hours. Instead of decreasing the desire for hand-painted books, printing only whetted the appetites of a wider audience. Workshop masters joined trade guilds to establish fair trade practices and reduce harmful competition from printers. The illuminated book guilds standardized the size of the books and developed a vocabulary of design that was both decorative and fast to produce. The second half of the century saw new fashions in books of hours like Trompe l'oile (fool the eye) borders where painted life-like flowers and insects appeared to be sitting on the page and the architectural style with borders made to look like Gothic buildings, furniture, and picture frames. Each master illuminator had a studio where the craftsmen were hired not so much for their talent as their ability to copy the master's style. So many people were employed in this trade that in one Flemish town there were over 40 workshops, plus parchmentiers, color men, gold leaf makers, librariers (book brokers), and bookbinders all working in some way on books of hours. 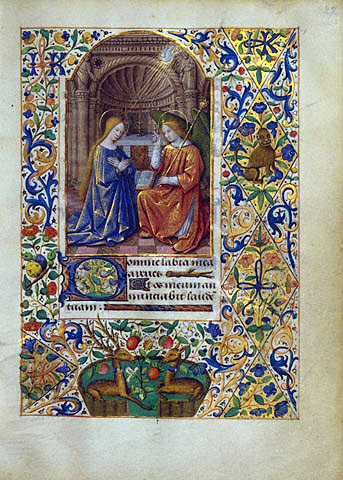 While called the Flemish-style, this kind of decoration and secular production was practiced by illuminators all across Europe due to the easy portability of books and the way artists were encouraged to travel after their apprenticeships were complete. These itinerant craftsmen, called journeymen, worked as contract labor for a variety of workshops, picking up new tricks and teaching what they had learned from their masters. This led to increased innovation and homogenization across the continent. 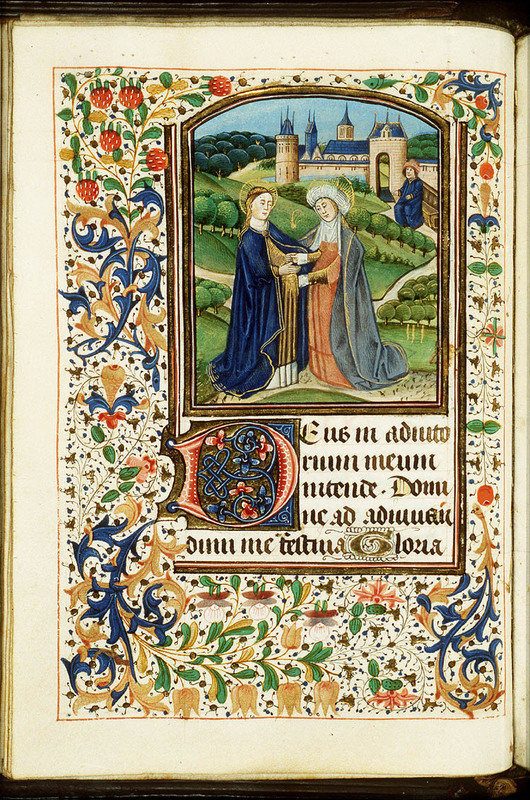 visiting St. Elizabeth within a foliated border. To become a member in a guild, a painter had to be the owner of a workshop and respected by the other members of the guild. Records show that women as well as men were employed in the trade and some owned workshops and became members of guilds. 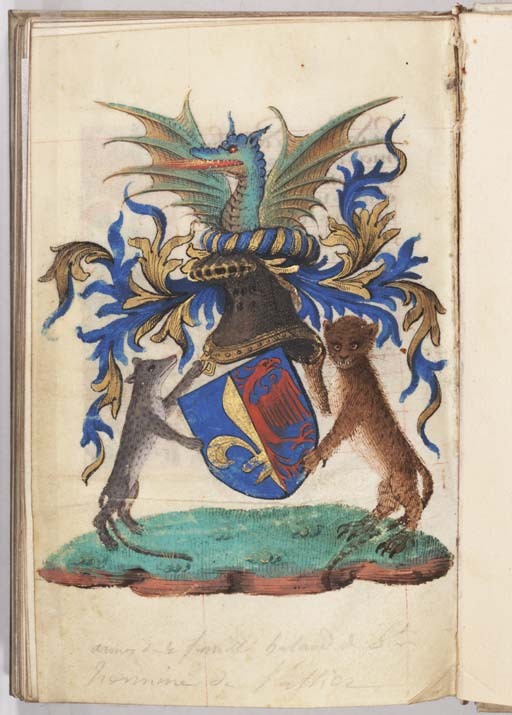 Guilds established prices based on the number and quality of each and every miniature, border, vingette, historiated capital, colored initial, and line fillers in the books with an extra charge for heraldry. Just to illustrate the relative values, a certain calligrapher was paid 14 French livre to copy the text for one whole book and was expected to provide the vellum at that price. The illumination workshop, on the other hand, was paid more than 10 times that amount to illuminate the same book! In comparison, it only cost 3 livre to have a thatch roof removed and replaced with a tile roof! It took 6 months to one year to produce an average book of hours, but with 200 to 300 pages each, that still meant that the studio had to finish more than one page a day. From the records that are in existence, it is evident that a big studio could have any number of commissions in production at once. So we can imagine that these studios were bustling, noisy, commercial operations and a far cry from the quiet, humble, monastic scriptoriums of previous centuries. and various websites sited above. If you want to add this article to your list of favorites or email it to a friend, please use this permanent URL, https://stores.renstore.com/-strse-template/0806A/Page.bok. Permission is granted by the author to quote from this page or use it in handouts as long as you include a link back to Renstore.com.